Because your diagram is stored online in SharePoint, you can easily invite others to review the diagram and add comments as part of a threaded conversation. Although Visio Online does not support simultaneous editing, there are ways to coordinate the editing of a diagram with others. You can share a diagram with others by sending a link to it in email. Open the diagram in Visio Online. For more information, see View, create, and edit a diagram in Visio Online. When you are viewing the diagram, select Share . When you are editing the diagram, select File > Share > Share with People. In the Share dialog box, select Send. For more information, see Share SharePoint files or folders in Office 365. You can share it by sending a link. People can view it in any web browser – whether or not they have Visio desktop or not. The following steps require an administrator to enable external sharing for SharePoint Online. Learn more. In the Share dialog box, select Copy link. For more information, see Share SharePoint files or folders in Office 365. Select Show more commands (...) > Comments. Add your own comments and view the comments of others. When you are editing a diagram, your session is timed out after five minutes of inactivity to help minimize the chance of an editing conflict. You can continue to edit by selecting Refresh in the message box that appears when you time out. You have the file open for editing in another browser tab or window. To release the lock, close the other browser tab or window. You have the file open in Visio. 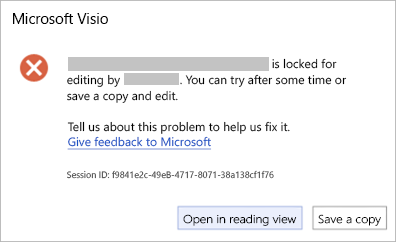 To release the lock, close Visio. Another user has the file open for editing in Visio or Visio Online. To release the lock, wait for the other user to close the file or for their session to time out. To view the diagram, select Open in reading view. To save a copy of the diagram back to the SharePoint library or OneDrive for Business folder, select Save a copy.